We’d like to convey a warm welcome to everyone in our school community. It has been great to meet all of our new students and catch up with our returning students this week. For our Year 8 and 9 students, returning means getting back into those learning routines that are essential for students to progress and achieve. Things like making sure they are getting enough sleep, making sure that they are prepared with all materials and making sure that they are in the right place at the right time are essential. Most students have made this transition back into school successfully and most homegroups have focused quickly on the learning in front of them. For Year 7s, starting at a new school is more involved. We have been doing a lot of work this week on key things like understanding the school, getting to know staff and who to talk to for different things, where things are and how the timetable works. We have also been doing a lot of work this week on developing relationships within the school. There have been many activities during pastoral care and lesson time to help our students learn names and get to know more about the students and the staff in their learning community this year. We have included photos of our new staff below so that you can get to recognise their faces. It is with some sadness that we inform you that Ms Cassie O’Bree, one of our Assistant Principals, has moved into a regional role supporting schools across the Alice Springs Region. Ms O’Bree has been an outstanding contributor to our school community over time and we thank her for all of her efforts. We have a number of important events coming up. Next Wednesday (6/2) at 2pm we invite our Year 7 families to come for a walkthrough of the Year 7 area so that you can see our classes in action. The following Wednesday (13/2) we invite all families to join us for an afternoon tea which will start at 4pm. This is an excellent opportunity to meet the teachers and start a relationship that we can build on as the year progresses. The afternoon tea will be followed by our School Council AGM which will start at 6pm. We have a School Development Day coming up on Friday 15th March. There will be no school for students on this day. We will be participating in a Middle Years Conference with all of the other middle schools in the Northern Territory, which is an excellent opportunity for us to share ideas and practice and develop our skills and understandings. This is obviously our first newsletter of the year. These newsletters will come out fortnightly in odd weeks and contain important information about the school. Please ensure you read them carefully. We also have a Facebook page which we use to share stories – liking our page will help to get school information posted on your Facebook feed. As always though, personal contact is usually best to clear up a misunderstanding or to resolve a situation. We encourage you at any time to come in and say hello to your young person’s teachers, us or other staff in the school. Alternatively, you can give us a call on 8955 2333. We are looking forward to an exciting year of learning! We welcome a number of new faces to the school this year. Please join us in helping them to feel welcome in the school. Our Swimming and Water Safety program commences next week (Monday 4th February). This involves a weekly lesson at the town pool as well as as theory lesson back at school. Families need to have completed the consent form and paid $50 to participate in the program. If you have not done so, please contact the school as soon as possible. Students have been informed of their lesson days but they are listed below for your reference. The Swimming Carnival will be held on Friday 8th March. We require that students are in full school uniform at all times – this includes a CMS polo, CMS or plain navy shorts and enclosed footwear. As the weather cools, a CMS hoody and plain navy or CMS tracksuit pants are required. Students should also have a hat at school every day. If a student is out of uniform, either they will be made to change into second hand loan uniform or you will be called to bring in appropriate uniform for them. As well as uniform, students need to at all times have an A4 exercise book for each subject (5 minimum) as well as pens, pencils, a ruler, a pencil sharpener and an eraser so that they are prepared for learning. If a book is completed or lost, it needs to be replaced by the family. Students have a tidy tray at school in which they can store these items or they can carry them back and forth each day in their bag. In some classes, exercise books will be kept in the classroom by the teacher. Fortunately, the NT Government has again provided a payment of $150 to support families to get students started at school. This can be used to purchase uniform, stationery or pay the swimming fee. This can be redeemed at Student Access and needs to be spent before the end of Term 1. Welcome to Centralian Middle School for 2019. In Term 4 of 2018, as part of a joint initiative between the Northern Territory Government, Department of Education NT and Northern Territory Police, it was announced that School Based Policing would return to the Northern Territory. The program will require ongoing development, but the key ingredients are for School Based Police to build positive relationships with students and deliver quality education and awareness programs to assist students in making good life decisions. 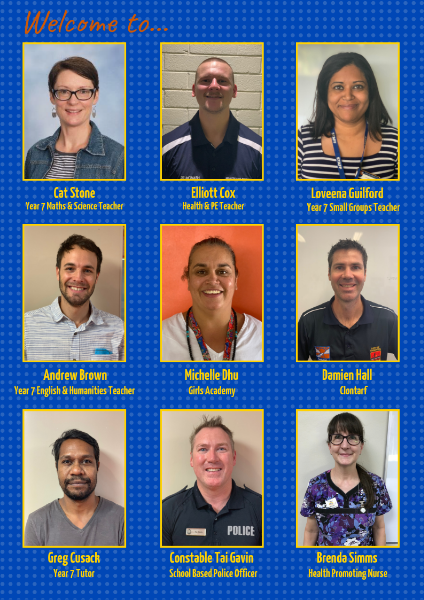 I’m currently the only School Based Police officer in Alice Springs, and am excited to be working with the students and staff of the Centralian Middle School team throughout the 2019 School year. CMS is not the only school that I will work with, so my time is shared throughout the Alice Springs school community. Throughout the year I’d like to provide important information from time to time, and what better way than through direct contribution to the CMS Newsletter. To start the school year, let’s talk about road safety. This is particularly important at the beginning of the school Term, while both students and other road users adjust to the increased traffic in and around school zones. Throughout the first 3 weeks of Term 1, Northern Territory Police will be pro-actively targeting school zones. This is not only in relation to driver behaviour, but also road safety around riding bicycles. The major message here is around helmet safety, through education and awareness. Recent studies show that the risk of serious head injury is reduced by nearly 70% from wearing approved bicycle helmets. They also reduce the risk of fatal head injury by 65%, and general head injury by 51%. From a legal point of view – ALL bicycle riders under the age of 17 years MUST wear a helmet at all times when riding a bicycle. If your child is riding to school, I would encourage you to have a conversation with them about road safety and ensuring they are wearing an approved bicycle helmet. I’ve also attached a Cycle Safety flyer with some great road safety advice. I look forward to seeing you all more throughout the school year. As you will be aware, students are not permitted to have phones or other electronic devices between 8.30 and 3.00 at CMS. Phones should either be switched off and away in bags or handed in to the Front Office to be returned at the end of the day. This is because the lure and distraction of phones and social media gets in the way of learning and we consider that students both need and deserve a break from these devices while at school. If you need to contact your young person during the day, please call our office on 8955 2333 and we will endeavour to pass on a message. Alternatively you are welcome to call them on their phone before 8.30 or after 3.00. If a student has a phone or other device (including headphones) out during the day, they will be required to drop it in the office and they can then collect it at the end of the day. If they resist doing so, the phone or device will be confiscated and you will be required to come in and meet with staff to collect the phone. We appreciate your support in this matter. There are many positive things that are made possible through social media. Unfortunately, many issues arise from how young people and adults use social media and there is increasing evidence suggesting a link between the increase in use of social media and mental health concerns. Issues have already arisen from interactions over the Summer holiday break. We strongly encourage you to discuss and continue discussing with your young person how they use social media. This communication will help them to feel that they can raise any concerns they may have with you. We also strongly encourage you to monitor your young person’s use of social media. Please note that in our experience young people commonly have multiple accounts on each platform that they use. If you or your young person have any concerns around interactions on social media, we encourage you to let us know. In our discussions with students, we recommend a – SCREEN SHOT / BLOCK / REPORT approach. Block – block the profile of the person who has sent the concerning interaction/image. Report – report the concern to a trusted adult for support, such as a parent or teacher. Young people can also report the concern to the social media platform (Facebook, Instagram etc), and need to do this before blocking. In our experience these reports are generally ineffectual at fixing the situation and we recommend that young people report to a trusted adult for support. If we can identify students involved in matters that are reported to the school, we will typically bring the involved students together to seek to resolve the issue and make an agreement on how to interact in future. We find that face to face people are much more respectful than how they interact online. If we cannot identify students involved or others involved are not a member of the CMS community, it becomes more difficult for us to respond. This is where it can be appropriate to report the concerns to the police. In these situations we work to support the student. We have a counsellor on site who can work with young people around a variety of issues, including those that arise from social media. We can also refer young people for support into specialist youth services such as Headspace. Please note that we do not respond to comments or posts that are made online. If you have a concern about anything at CMS the way to seek resolution of those concerns is to contact the school directly. Comments made online can make resolving a situation more difficult as well as potentially being defamatory. Much easier to give us a call!